Dina Yafasova – Don’t Call me a Victim! Henk-Jan van der Klis 5 februari 2015 29 maart 2019 No Comments on Dina Yafasova – Don’t Call me a Victim! 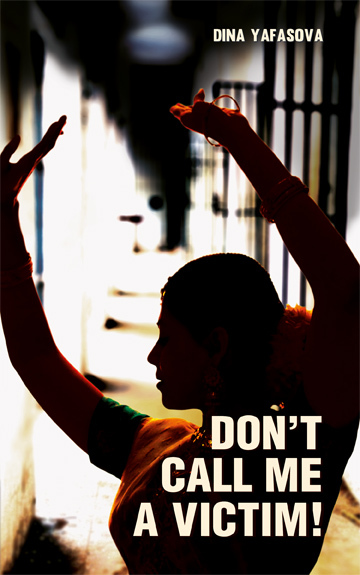 The novel Don’t Call me a Victim! by Dina Yafasova tells the remarkable life of the Bengali woman Archana Guha, whose unique destiny became the subject of continuous media attention for nearly twenty years since the 1970’s in India, Europe, USA and Japan. Archana’s younger brother Saumen Guha had joined a communist terrorist underground movement. In 1974 Archana, her brother’s wife Latike Guha and a family friend, Ms. Gouri Chatterjee, were taken hostage by the Kolkata police. The three were tortured and forced to betray Saumen, but their torturer, police officer Runu doesn’t succeed. Released and directly imprisoned again, the family can only receive visits by Archana’s crippled mother. Saumen is also held hostage, but the three women don’t know that. Only through political changes in India, the 4 are freed. Archana is bruised and paralyzed so much, that she can’t walk anymore. The second part of the book deals with the longest legal battle (19 years) which Saumen had initiated to seek justice for her sister Archana. Archana gets help from Danish doctors and learn to walk again. Per Jensen, a Danish, falls in love with her, and marries Archana. Both processes are painful and cost lots of energy. Victim becomes torturer, and vice versa. The hell is the other. A human drama involving torture as a human invention to combat terrorism, terrorizing victims alike. Set against the background of the developing countries of India, Japan, Yafasova steps into the storyline every now and then, changes the protagonist, but is also heavily involved in unmasking this human flaws and struggle to survive when humanity seems stripped away. Born in Uzbekistan, Dina Yafasova worked as an accredited correspondent in Central Asia for the Danish and other international media. For results of her investigative journlistic work being published internationally, Dina was harassed by the Uzbek security services, and after a series of severe interrogation, repression and attacks forced to leave their homeland. Since 2001 Dina lives in Denmark, where she initially worked in a Danish international organization. Dina made her debut as a writer in 2006 with a book of autobiographical prose. An extended biography is available on her website. I received the book from the publisher, Glagoslav Publications, through Librarything‘s Early Reviewer program.